Located 7,500 light-years from Earth, the Carina Nebula is home to some of the most spectacular celestial objects in the observable universe. New images captured by the ESO’s Very Large Telescope are offering some unprecedented views of this ethereal celestial structure. The majestic spires and pillars within the Carina Nebula were were observed by ESO PhD astronomy student Anna McLeod and her team, who did so by using the MUSE instrument on the VLT. MUSE created thousands of images of the nebula at the same time—each at a different wavelength of light—allowing for images of remarkable depth, color, and clarity. The instrument also allowed the astronomers to study the various chemical and physical properties of the material within the nebula at different locations. These vast clouds of dust and gas serve as factories within which stars are born. 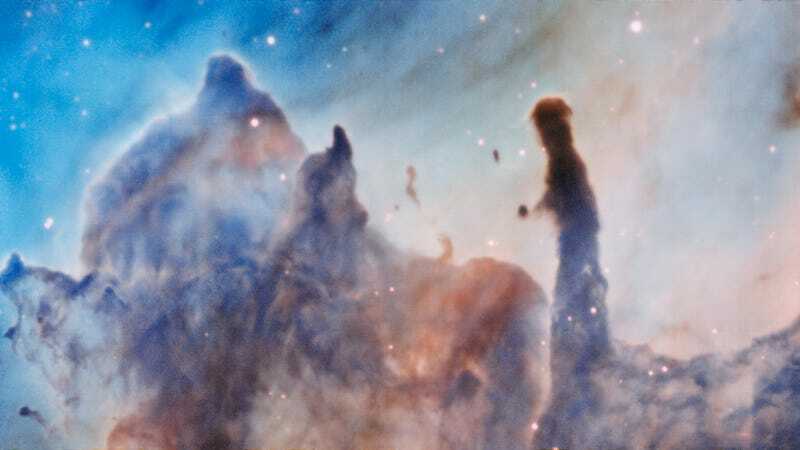 The ESO team managed to observe ten distinct pillars in the Carina Nebula, which bore a startling resemblance to the iconic Pillars of Creation (which is located within the Eagle Nebula some 7,000 light-years away). The researchers were able to correlate features within the nebula to the effects of radiation emitted by nearby massive stars. Ironically, the emergence of a new star within the nebula causes the beautiful cloud formations to disintegrate. Ionizing radiation that blasts outwards by the new star strip atoms of their orbiting electrons in a process known as photoevaporation. Images like the ones collected here are helping astronomers to better understand these processes, and how the effects of photoevaporation might actually work to create denser spots within the nebula, which can go on to form new stars.